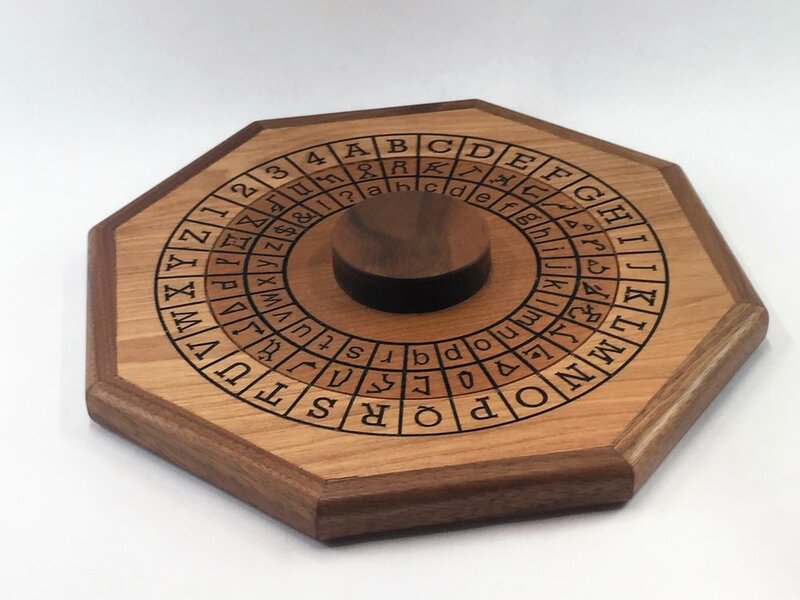 This is my third version of cipher wheels. It has the same octagonal design of my earlier model but includes several new features. First are 4 numbers in the plain text that are used for creating a variety of new and more complex codes like numeric shifts, numeric keywords and symbol rotations. There is a whole section of the site dedicated to all the ciphers you can create and the list is steadily growing. The inner ring on this design features a set of constellation like you would find on Stargate. I drew all the constellations by hand and then imported the images for cutting into the wheels. They also feature a letter ring so you have the best of both worlds. 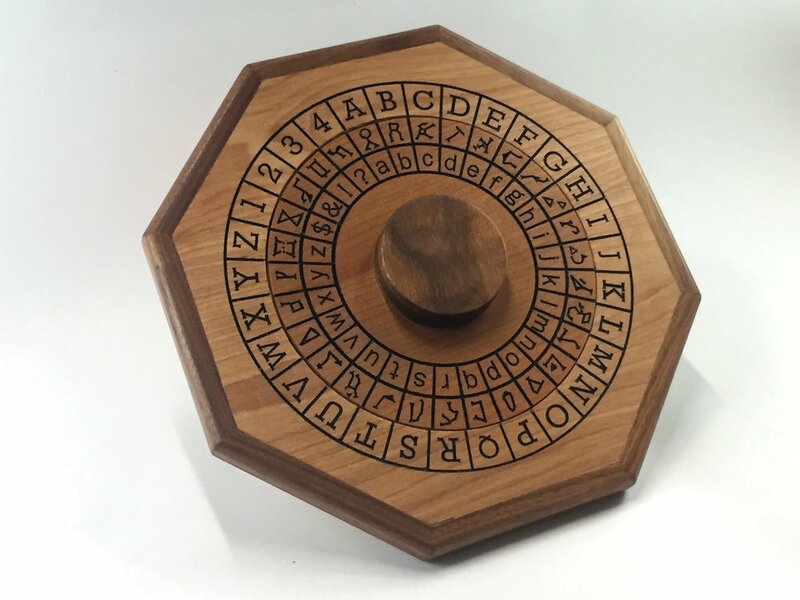 These wheels are great for anyone interesting in cryptography. They make great desk or table talking pieces. 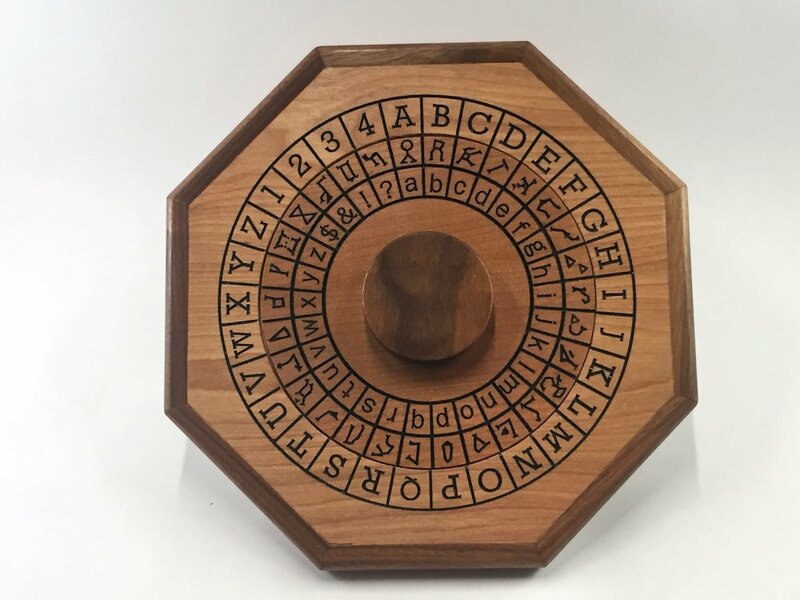 Escape rooms should especially like them for the variety of puzzles they can be a part of. These wheels are made from a veneered substrate for stability edged with hardwood, reclaimed walnut. The center wheels are also veneered substrate to keep them working perfectly. The characters and symbols are all deeply engraved and then painted. The edging is finished with danish oil to bring out the grain. All the parts are then coated with a wiping poly for protection. The center wheels are removable if a repair or re-waxing is ever needed. These measure about 11 inches across, are 3/4 inches thick and weight about 1 lb. They each cost 87.50 with free shipping in the continental US. I have two currently available, one with a maple center ring and one with a cherry center ring. Each is $87.50 with free shipping in the continental US.